Duncanet is a family website that focuses on the Duncan family, including relatives all over the country . The purpose of this site is keep all family in touch with others, keep everyone up-to-date on all family news and functions, and give everyone the chance to let others know a little bit about themselves and what is going on in their lives. I will do my best to keep this website updated and continue to add information, eventually encompassing the entire family. Obviously this will take a lot of time, but hopefully soon I will be receiving information, pictures, and favorite links for all other family members, and will put the site together as time allows. (Click here for instructions on sending me your information.) Keep checking this site because it will be updated often. Please e-mail any comments, suggestions, or any information you would like to see on this site to me. My name is Doug Duncan and I created and will maintain this website. 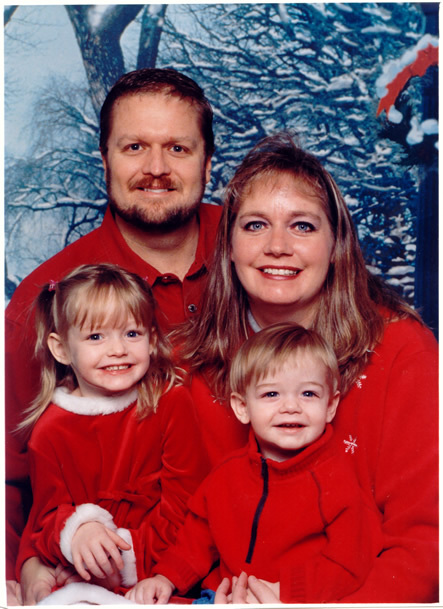 The photo to the left is of my wife Crystal and I, and our two kids, Ashley and Brandon. It was taken Christmas of 2003. Click for larger view. Quick Tour: On this site you will find many things, including lots of information on families and individuals in our crazy mixed-up enclave. Each individual or family is requested to submit a little information on themselves, which could include biographies, current events, family and vacation photos, and favorite links of hobbies and personal interest. Like the photo on the left, there will be lots of pictures of journeys to exotic (and not-so-exotic) places around the globe, and also some writings of adventures in those places. I'm sure we have some great writers in the family, so I would appreciate anything of interest to be sent to me and I will be glad to post it here. This would include anything that others would enjoy reading or current events, or even personal journals. There will also be relevant information on any news or information that would involve or be of interest to the family and friends of the family. I hope to eventually have this section divided regionally for families in different parts of the country, and what is going on in their respective areas. I will also include a list of events for the family functions and the dates and times and any other information that would help you attend these events. An example would be the Sullivan/Lumley/Duncan family reunion hosted in Montana each year. It always ends up being a great time! Navigation: The navigation interface on the top of your browser window is pretty self explanatory to get you to the main pages. From there you can select links within the left-hand column that are relevant to those pages. You will notice I have also included a Forum for visitors to read and post. There are many categories, but I will add more upon request. Feel free to post anything you like there. You can sign up for a login (free) so you can see all the forums, but there a couple that do not require a login. It would be interesting to see the visitors to this site and where they are from. I have also included an Contact link that will contain the e-mail address of everyone involved with this site. I will list them alphabetically so as to be able to find the person or people you are looking for easily. I will also include anyone who wishes to have their e-mail address posted here, whether or not in the surrounding family or circle of friends. If yours is not there or is incorrect, please let me know. Remember: This site is wholly for the benefit of family and friends of everyone related to the Duncan's/ Sullivan's/ Scott's/ Lumley's/ DeBeauxs', etc. , whether by blood, friend, shirt-tail or otherwise. This is a family and friends site and I would appreciate anything associated with the family and friends, no matter how off-kilter or irrelevant, to be sent to me, and I'm sure it will be enjoyed by everyone who visits. So please, start sending the info (click here for instructions). Any write-ups on current get-togethers or general information of recent events would be appreciated, along with personal info of everybody who would like to be on the site. Of course, full credit will be given to the author of any information I post on this website. If you have photos or documents that are not in digital form, I would be glad to scan them for you and return them when added to the website. All I ask for is return postage paid. Welcome to the all-new Duncanet website. I have completely redesigned the site to a more appealing look and much easier navigation. I hope you enjoy it. Please send me any feedback you may have here.